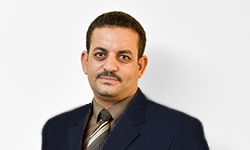 Salama obtained his LLB from Ain Shams University – School of Law in 2001. Salama joined Eldib & Co in 2009 as an associate specialising in corporate, labour and real estate law, as well as in litigation. He has participated in several high profile cases, mainly concerning inheritance, wills, and agricultural land. He handles these cases prudently and has been able to yield favourable results for our clients. Salama is a member of the Egyptian Bar Association.